Where is Habit Burger? I have heard of it but never visited it. 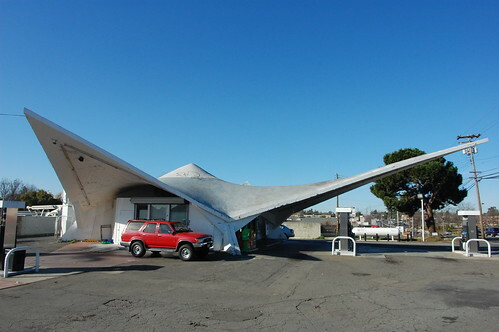 An aside, I always thought Suzie Burger should go where the iconic Orangevale Orbit is. It is the perfect spot for it. There is a Habit on corner of Hazel\Sierra College and Douglas in Roseville in the shopping center where a vacant grocery store is and a few small shops. The newer center that has Staples\McDs\Safeway in it is across the way. As to burger, I rate it in the In-n-Out level. Good basic burger and fries and of the two, I would go In-n-Out. Murder Burger, Suzie Burger and Nations are very good but there are others it should have included like The Counter in the Fountains, Roseville and the upcoming Relish which opened today in EDH. I'm a huge fan of the Habit - they started in Goleta/Santa Barbara and when I worked down there there were only two locations, now they're popping up all over. I was really glad when they opened up the one in Roseville. IMO, The Habit is equal (if not slightly better) then in-n-out. I really like Habit too. Wish it was just a bit closer. Gatsby's Diner is a newish place that has great burgers in Sac too. Very 'gourmet' and it's in what looks like an old teppanyaki place, so the chef grills everything out in the middle of the seating area, instead of in the back. Makes for a nice little show/distraction/gimmick. I've passed a place called "Habit" on Sunrise in Citrus Heights -- didn't know it was a burger joint. A good friend of mine, a gourmet himself, said that Gatsby's is the best burger around. He's one of those guys that, if he says it's a great burger, it must be a great burger. I don't like leaving the Folsom bubble, but I may have to for this. Picnic Barbecues make the best burgers in the world. 2nd best comes from Backyard Barbecues. Gatsby's was featured on Diners Drive-Ins and Dives, looks good. They also showed a place called Dad's near Land Park that made this bruger with bacon and Bleu Cheese that looked outstanding. I was underwhelmed by Nationwide, and Squeeze Inn seems to have lost something, their burgers aren't as juicy as they once were. I must say the burgers at Samuel Horne's and Manderes are as good as any othehrs I have had. We must go check this place out and try those gourmet burgers! I'm in, although I want to check out Dad's as well. A buddy of mine owns Dad's, and I've been remiss in not making it in there. What can I say? It's outside the bubble! I don't do burgers too often, and haven't been to most of those places. Red Robin - My daughters drag me there. Good veggie burger. Sutter Street Steak House - $1 sliders during happy hour are FANTASTIC. Joe the bartender is great, too. If anyone is going to drive all the way to Sacramento for a burger, you need to get one at Morton's. It is only available in the bar. $17. If I ranked burgers on a 1-10 scale, this would be near a 20. Before someone starts critiquing me, I eat at Suzie Burger (ranked #1 in the above article) a few times a month, and while that place is great, it does not even compare to Morton's.